Kate Shackleton is asked to try and trace Lady Coulton’s illegitimate daughter who was adopted at birth. Kate is unusually reluctant to take on the case but isn’t sure why. 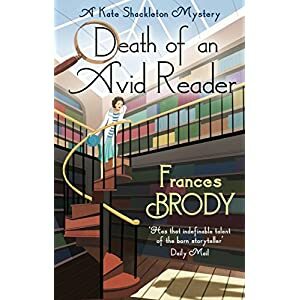 At first everything she tries leads to a dead end and then she becomes inadvertently involved in a murder which was committed at the Leeds Library of which she is a share holder. Dr Potter – scholar and enthusiast is found dead under a fallen bookcase un the basement of the library. Libraries have a connection with Kate’s search for Sophia Wells as she is believed to be working in a library and when she hears a library assistant has apparently left her employment without notice she starts to wonder whether the cases are connected. Featuring Kate’s assistant, Jim Sykes, a monkey called Percy, a parrot called Polynesia and some very nasty crimes this is an absorbing and well written mystery story set in and around Leeds in the 1920s. The author brings the background vividly to life and Kate Shackleton herself is an interesting character. I though the plot was particularly well constructed in this story which in my opinion is probably the best of this excellent series so far. If you enjoy crime novels set in the 1920s then you may enjoy this series. They can be read as standalone stories but if you read them in the order in which they were published you find out more about Kate’s background and how she came to be a private detective.